This post has originally appeared at Citispi’s blog here. Introducing, Chef Mohammad Iqbal, who has been at the JW’s Steakhouse since it opened its doors 21 years ago. We were very honoured to have met the man himself last night – very humble, and polite as he showed us the restaurant, one of the oldest, and supposedly first steakhouses in Dubai. He then said us, ” Your steak is ready, ” and we made our way back to our seats, to the much anticipated main course. It’s not everyday that you get the chef himself telling you this, just one of those moments in dining that you will always remember. Winding back to the start of the evening, when my husband and I drove (and was unfortunately stuck in peak-hour traffic for nearly an hour) to the JW Marriott Hotel in Deira. We were there to trial dishes, taken from their original 1995 menu, where prices would be as it was then. In line with their 21st anniversary, starting from the 28th of October for 21 days, everyone else would be able to do this. We honestly recommend it – especially if you love a good steak, for a great price. 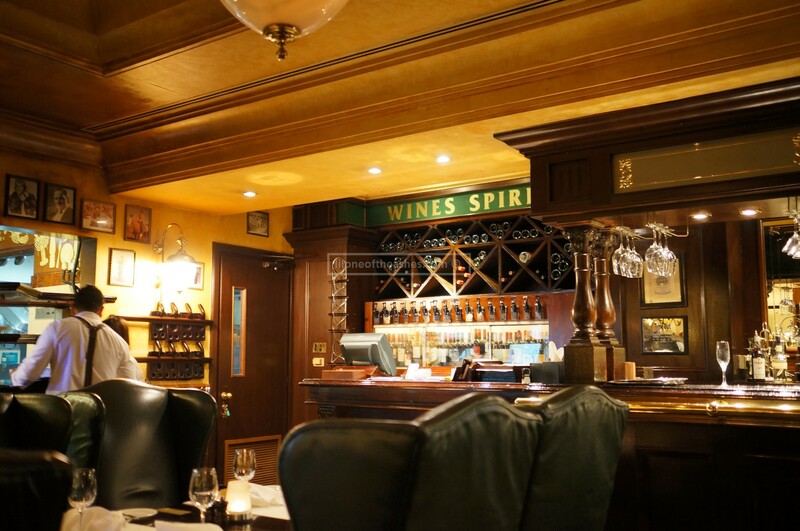 As you would expect from a cosy steakhouse, the JW’s is all that. Large leather-clad arm-chairs, reminisce of the Godfather, with memento’s hung off the walls. Loved the engraved metal plates on the wooden tables, for the steakhouse’s regular guests – whereby you will have to have dined 24 times over 6 months. That’s a lot of good steak, we thought. After having their freshly baked bread, came our starters – the lobster bisque (AED 43), presented with flaming brandy poured onto it, and the jumbo prawn cocktail (AED 75), which came smokin’ with dry ice. Dining experiences like these is what makes fine dining restaurants different from the rest. My lobster bisque was warm, and had just the right amount of saltiness in it. The prawns were jumbo (humongous) alright – no doubt about that! And absolutely delicious. The JW’s Steakhouse Salad (AED 22) was tossed together right next to our tables, and complemented the bisque and prawns well. For the main show, I chose the rib-eye, medium-well. A good 10 ounces of it, for AED 130 – how I wish steak prices stayed this way all the time! I could not fault the steak, perfected with a glass of house merlot. The husband opted for fillet mignon – 7 ounces for AED 98, also perfectly cooked medium. The sides portions were extremely generous, and I would recommend you choose only two to avoid wastage (or, please, take them away!). Sauteed mushrooms with herbs ( AED 20 ), creamed spinach ( AED 20 ) and sweet potato fries ( AED 20 ). 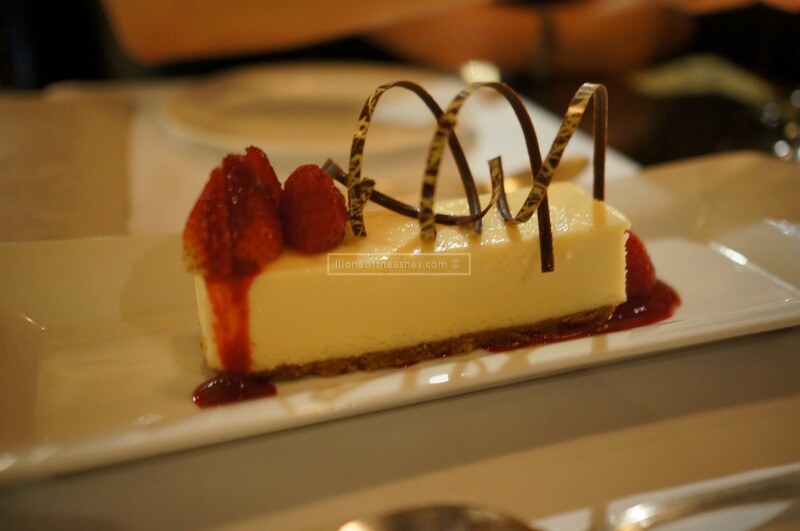 And for the finale, a classic cheesecake (AED25), to finish the evening. How I wish we had another stomach to complement this with tea or coffee. It was around 10:30 pm when we finished off the evening, said goodbyes to the team and drove home to the marina to check on our little girl, who was sound asleep. For such a good price, I cannot find any fault to our dinner experience. If only it was closer to home, then we would be there more often. And if only someone will fix up the traffic going up to Deira from the marina side of town. Honesty recommend you check it out whilst the promotion is on-going! Disclaimer : We were guests of JW’s Steakhouse for dinner. All thoughts are honest as usual, though it is entirely up to you to judge.